Home is where the craft is.....: Who said leaves have to be green? It's Wednesday so hopefully all of the children are back to school and we are returning to a bit of normality and routine. I have had a lovely 6 weeks with my children and we even managed a couple of mini holidays. 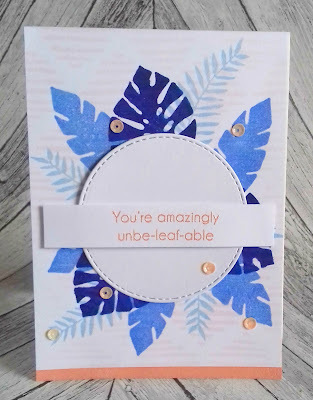 Now it's time to get back to the fun of stamping and creating and I have a card to share with you. As you will have seen in a previous post I am a big fan of the Parrot paradise stamp set that Lydia Evans designed for Altenew. I love tropical leaves and the holiday vibe they give off. I decided to go down a different route with my colour options this time and opted for blue tones and golden peach highlights. I applied a very light covering of blush ink through the sketched lines stencil and then stamped the leaves in a circular pattern using the Deep blue seas inks from Altenews recent release. I die cut a circle with a stitched border and placed this on foam pads. My sentiment is also from the Parrot paradise set, this time I chose to heat emboss it with the Golden peach crisp embossing powder, I also added a strip of peach embossed card at the bottom to tie the whole look together. I was luck enough to have sequins in my stash that match the peach colour so added a few using glossy accents to adhere them. Here's links to the items I used in case you want to add them to your stash. Thanks for stopping by today, I'd love to know what you think of the blue leaves in the comments below. 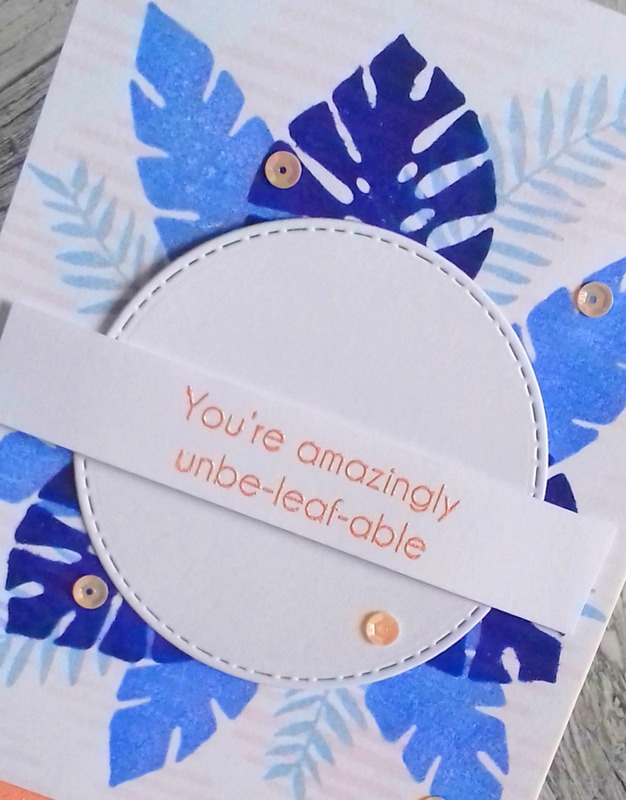 A beautiful card, love the leaves!